The 4 teams that will advance to the semi-finals of the 2018 FIVB Women’s Volleyball World Championships are set. 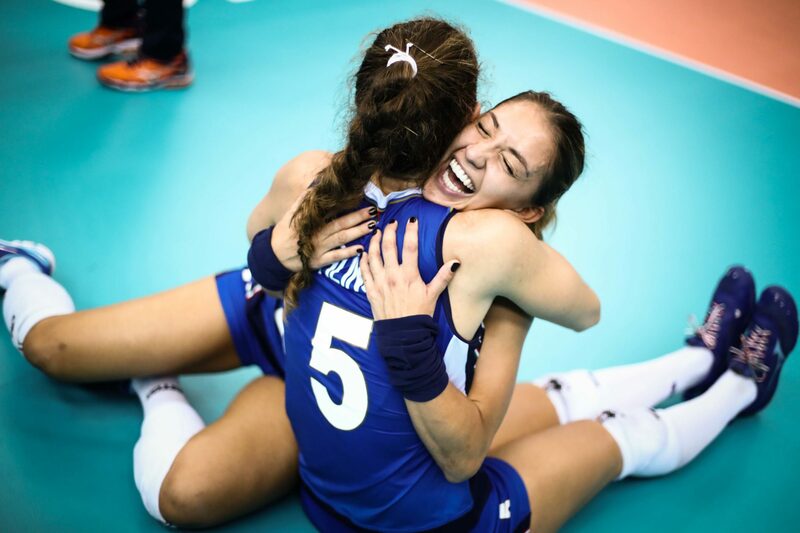 At the conclusion of Monday’s matches, hosts Japan had 2 losses in Pool G, which means that Serbia and Italy are assured of advancement; while in Pool H, the United States lost their 2nd match, at the hands of the Dutch, and so the Netherlands and China will advance. The way that the schedule worked out, the team playing the day 1 and day 2 back-to-backs in both pools (Japan and the United States) were eliminated. That means that Tuesday’s matches won’t be for advancement, but rather they will be for seeding purposes only. The scenarios are pretty simple: the winners of each of Tuesday’s matches will win the pool, while the losers will be the pool runners-up. The winners of each pool will play the runners-up of the opposite pool. The Italy-Serbia match will be the early game on Tuesday. In this scenario, without some insider info about how the Dutch and the Chinese will approach their match, the win is effectively moot. It’s a bit of a circular reference, but basically, the Chinese and the Dutch will know exactly where they stand heading into their match later in the day, but with how well both teams have played, there’s not an obvious upside to ‘throwing’ that match and being able to play the Italians or the Serbians. Either will be a brutal semi-final (and, in this writer’s opinion, Italy and Serbia are the favorites to advance and play again in the final). So if the Dutch and the Chinese have no incentive to go full-bore, tire their players, and risk injuries to their stars, then neither do the Italians or Serbians. Expect to see a lot of reserves in the matches, and no team intentionally trying to lose, but also none of the 4 teams putting much effort into winning, either. The Netherlands’ women have never placed higher than 7th at the World Championships previously, which they’d already improved upon by qualifying for the Final 6. They finished 7th in 1998 in Japan, and 8th in 2006 in Japan, which were their two prior best finishes. Now, again in Japan, they’re guaranteed of at least a top 4 finish. The Serbian team took a bronze medal in its first World Championship in 2006, just 4 months after the country splintered its union with Montenegro in June 5th of that year. This is their first trip back to the semifinals (or even the 3rd round) since. The Chinese women won titles in 1982 and 1986, and took silver at the most recent championships in 2014. Their 5 all-time medals (2 golds, 3 silvers) at the tournament is more than the other 3 semi-finalists…combined. Since the Italian women won in Germany in 2002, they haven’t been back to the podium at the World Championships, though they’ve been close. They lost the bronze medal match in both 2006 and 2014, and were 5th in 2010.